Mrs. Gong and Ji Seok aren’t on the same page, but looks like Seon Yu might honestly give up on Ji Seok as per granny’s orders out of guilt alone. I do have to say that I’m grateful Gi Jin is there to call her an idiot and make her face her true feelings for Ji Seok—to hell with the promise she made herself when Jin Yu died. Oh…and you have to love it when someone mentions “baby” to Tae Jeong…he finds it so distasteful. And now Ji Hui is kind of on the baby bargaining chip bandwagon, too…but after the miscarriage and everything that has been going on, she seems less than enthused about the matter. So Seon Yu refuses to fess up to what Mrs. Gong has asked her to do. Ji Seok is concerned and worried, but Seon Yu just waves off the meeting. She and Ji Seok then plan to have their party tonight after missing it because of the necklace incident. And you can tell right away just what Seon Yu is doing. It’s obvious to me. It happens so often in dramas. Person A likes Person B but for whatever reason will choose to leave and thus they work hard to create that “last perfect date” for Person B. Seon Yu goes back to her office very unhappy only to have Tae Jeong rain on her parade and tell her to shut Gi Jin up before he ruins them both. Just what Seon Yu didn’t need on her plate, huh? At the parlor, Bangtong reveals that Seon Yu was home and called back out once more by the chairwoman. This makes the Heo family happy as it bodes well for Seon Yu, doesn’t it? Of course, Gi Jin knowing the truth can’t stand this at all. He rushes out of the parlor. It’s not right. He won’t let it happen. Plus…he really needs to find out the truth from Seon Yu herself now that he’s gotten the info from Ji Seok. Tae Mi sees him and hides and then decides he might not know the truth, plus he may hate her brother, but not her, right? She fake runs into him and his hatred for Tae Jeong is boiling over. Hearing this Tae Mi tries to give the “love your enemy” speech, but Gi Jin is having none of it. He storms off and Tae Mi thinks. Jang Tae Jeong. Jang Tae Mi. There is no way that Gi Jin won’t put two and two together once he hears her name. Should she get it changed? LMAO. That’s Tae Mi for you. I am surprised that she didn’t catch the whole Tae Jeong killed Jin Yu thing and ask what that’s all about since she’s been kept in the dark all this time. Seon Yu shows her attentive and caring side and shows she really does listen to Ji Seok. This makes him really happy and he urges her to forget everything else save him. Awww. This is hurting Seon Yu more and more because we know what decision she’s already made about him. Pung Ho and Bong Hwang arrive on scene and invite Ji Seok in for some tea. Ji Seok accepts and he promises the Heo family he’s serious about Seon Yu and wishes to marry her. When he is about to reveal his family background en toto, Seon Yu comments on the lateness of the hour and Gi Jin finally arrives home. He jumps in as well about the time and Ji Seok looks at his watch and realizes just how late it is. Crisis averted…barely and not for long. Seon Yu and Gi Jin see Ji Seok out and Gi Jin asks his nuna to talk. They end up at a tent bar where Gi Jin downs alcohol like water and asks for Seon Yu’s story. She says she is just using Ji Seok. Gi Jin doesn’t believe this as she isn’t that kind of person. Plus…he has already heard from Ji Seok that they met before Jin Yu’s death. Seon Yu then finally reveals the whole truth and what made her accept Ji Seok’s feelings. Gi Jin still isn’t happy about the lies. Why couldn’t Seon Yu just be honest from the start? I agree. Though…Ji Seok probably wouldn’t be secretive and plotting and would be going against Tae Jeong outright. There is nothing wrong with that method, but it might be less than satisfying for Seon Yu. Anywho, Gi Jin wants to know her true feelings. Seon Yu reveals the promise she made at the convent and Gi Jin basically says it is rubbish and requests to know once more. Seon Yu does reveal how much she loves being with Ji Seok and how much she hurts lying to him—she is being punished already for her sins. Gi Jin yells that is a sign she’s in love and drinks more. Yeah. I understand his pain with his cousin’s decisions. Right or wrong, she (and Ji Seok) can only suffer with the truth…or can they overcome it? At the Seo home, Ji Seok is happy and asks his grandmother to continue to look after Seon Yu not just as a secretary, but as her future in-law. Mrs. Gong commits to nothing and Ji Seok goes out where he runs into Aran. His stepmother gives her seal of approval and hopes this relationship ends well. This surprises Ji Seok, but he is happy to have one family member’s support. He goes up to bed where he calls the unhappy Seon Yu to let her know he arrived home safely. He asks after her family’s reaction and she replies they are happy with him and have liked him since they first met. This makes Ji Seok happy. He talks about his grandmother and her approval, but Seon Yu already knows the truth. If Mrs. Gong hadn’t held kicking Ji Seok out of the Seo family, Seon Yu probably wouldn’t have caved quite so easily. The next day Seon Yu goes to the office and tells Mrs. Gong she will prepare for the meeting between the families and will definitely leave Ji Seok. This makes Mrs. Gong happy. Meanwhile, Gi Jin is wasted and the pizza parlor is backed up on deliveries and orders. Enter Wu Hyeon who came for a meal. He ends up making deliveries with Bangtong instead. We do see that behind his cheerful exterior (and infinite brattiness towards Wu Hyeon) is a hurt little boy who misses having a father to do things with like other little boys. You just know that Wu Hyeon will do something about a bike for Bangtong. 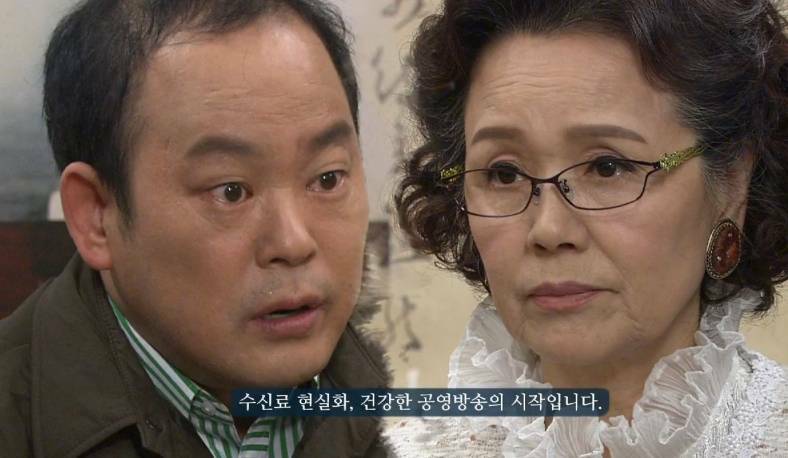 Mr. Kim reports Seon Yu’s background check to Mrs. Gong. HOW can nothing come up about Tae Jeong at all? There HAS to be something somewhere you’d think considering how long they knew one another and how long Tae Jeong dated Jin Yu…but then again, even Aran couldn’t dig up anything after the initial trail went cold. He also reveals Wu Hyeon is back at the parlor owned by Seon Yu’s relatives. So what does Mrs. Gong do? She goes to the restaurant to collect her son and to talk with Pung Ho. She wants him to turn Wu Hyeon away as Seon Yu and Ji Seok will soon be no more. Pung Ho is very upset by this and even more so when Mrs. Gong reveals she is the chairwoman of L Foods. End episode. What else happened? Dal Nyeo is sick of living with her daughter-in-law and son. She wants Mrs. Gong to take them back and decides a baby is the best answer. She takes Ji Hui for Eastern medicine, but it doesn’t look too good for her conceiving. Also…Tae Jeong is not on baby bandwagon. Neither is Ji Hui, but she can admit a baby will bridge the gap between them an her grandmother. We also get Tae Jeong unhappily learning that Aran will do whatever she can to push the marriage between Ji Seok and Seon Yu forward as that will be his first official step out the door since Seon Yu is powerless to help him and Mrs. Gong can’t protect him forever. Seon Yu…did she overhear that part of the conversation or not? What will Ji Seok do when he learns the truth? You know he’ll fight for Seon Yu even if she’s willing to let him go to save his place in the Seo family as he is now willing to fight and not run away and protect what is rightfully his. I love JS in action. He is so logical. I sure wish SY would tell him the truth. Not that he trusts AR or TJ but he does love his sister even as misguided as she is.